The Orthodox Church is not established on rational intellectualism and moralism, but on the revelatory experience of the Prophets, Apostles and the Holy Fathers. This is what distinguishes Her from western scholasticism and moralism. God is not a subject to discover by rational man, but He reveals Himself to the pure heart of man, according to the words of Christ: "Blessed are the pure in heart, for they shall see God" (Matt. 5:8). In the Synodikon of Orthodoxy, which is read on the Sunday of Orthodoxy, it says among other things: "As the Prophets beheld, as the Apostles taught, as the Church received, as the Teachers dogmatized ... so we declare, so we assert, so we preach Christ our true God." In this passage we are shown that the visions of the Prophets, the teachings of the Apostles and the dogmas of the Fathers are identical. Orthodox theology is not reflection and imagination, but experience in the Holy Spirit, and doctrine is the delineation of the personal revelatory experience, and this is done for the salvation of man. Finally, doctrine are the expressed words and meanings of inexpressible reality, and its purpose is to be medicine for man to gain communion with God. Through this perspective we must see the dogmatic truths concerning icons. The Orthodox icon is a manifestation of the uncreated glory of God, so that man can be guided to this experience of divine glory. The Holy Fathers operate within this reality, which is why the Synodikon of Orthodoxy repeatedly says that we walk "according to the divinely-inspired theology of the saints and the pious mind-set of the Church". The historicity of the ecclesiastical event that is celebrated on the Sunday of Orthodoxy consists in the restoration of sacred icons that took place in 843 A.D., and in fact during that year the prestige of the Seventh Ecumenical Synod was restored, that convened in Nicaea of Bithynia in 787 A.D. and theologized regarding the value of sacred icons in the Orthodox Church. This theology was expressed by the ancient Fathers, such as Basil the Great, as well as other Fathers who lived closer to this Ecumenical Synod, such as Saint John of Damascus, Theodore the Studite, et al. Before the Ecumenical Synod, as well as after it, there developed a wonderful theology around the icons of Christ, the Panagia, the saints and the Honorable Cross. Icons are not external symbols, but expressions of the mystery of the Incarnation of the Son and Word of God and the theosis of man. In fact the narrations on sacred icons show the hypostatic union of created and uncreated in the Person of Christ, and the union of man with God according to Grace. It should be noted that this Ecumenical Synod was attended by representatives of all Churches, even of Pope Hadrian of Rome, who signed the decisions of this Synod regarding the theological value of sacred icons. There was still unity between Old Rome and New Rome and, despite distinct traditions of non-essential doctrinal issues, they had a common faith, theology and life. However Charlemagne, the ruler of the Franks, in order to distinguish himself from the Roman Empire and implement his own plans, disagreed with the decision of the Seventh Ecumenical Synod, and immediately drew up a response with the known Capitulare Adversus Synodum in which he rejected the decrees of the Seventh Ecumenical Synod. However, Pope Hadrian - who participated in the Seventh Ecumenical Synod with his representatives, and even in the Acts there was included a letter of his that showed his commitment to the ancient traditions of the Catholic and Apostolic Church and was endorsed by all the Fathers who were present - sent a letter to Charlemagne in which he expressed his objections to his decisions. When he received these explanations of Pope Hadrian, who defended the decisions of the Seventh Ecumenical Synod, Charlemagne, instead of rejoicing over the victory against the iconoclasts, gave a command to his consultants to put together a new theology. This is how the Libri Carolini was written, which shows the contrast between the Frankish and Orthodox views of the Pope of Rome, as well as all the Patriarchs of the East who participated in the Seventh Ecumenical Synod. Charlemagne convened his own Synod in Frankfurt in 794, in which he formalized the recent divergence of the theologians of his court, and among other things objected to icons in worship and introduced the filioque into the Creed. This is a key point of differentiation between a section of Europe from the Orthodox unity that existed between the Five Patriarchates, that is, between the Pope of Rome and the Patriarchs of the East. But when in 1009 the throne of Old Rome was occupied by a Francophile Pope and introduced the filioque into the Creed, then came the schism, the division, resulting in the progressive move of the Western Church towards the decisions of the Synod of Frankfurt against the sacred icons. In this way statues were introduced in worship, and icons lost their spirituality and the theology of the Orthodox Catholic Church, and thus there developed the naturalistic and sensationalistic perception of the icon. The second point to be examined is the difference between the Orthodox-Byzantine icon and the Western icon according to two specific models found in the West and in the East. The western style of the icon, such as prevailed in the West during the Middle Ages and early Renaissance, is best expressed in the paintings of the Vatican's Sistine Chapel, which was painted in the 15th century by great artists, the most important of whom was Michelangelo. Recently there was published a book which gives a new interpretation of the whole iconography of this church. This book is written by Professor Heinrich Pfeiffer, who tried to arrive at a theological interpretation of the iconography of the Sistine Chapel, the basis of which were the doctrines of Catholicism. It argues that in this work the choice of subjects, the details of the murals, the unity and harmony seen in the iconographic program, were not designed by the artists themselves, but by papal theologians at the time. On the subject of the Triune God, the iconography was based on the teachings of divine Augustine on the procession of the Holy Spirit from the Father and the Son. 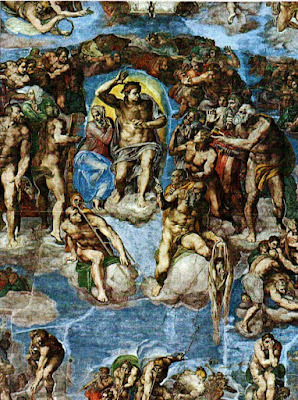 It is remarkable that Michelangelo painted the Sistine Chapel as a sculptor and painted biblical personages as statues, founding "spontaneously anthropocentrism and the rule of classical antiquity." 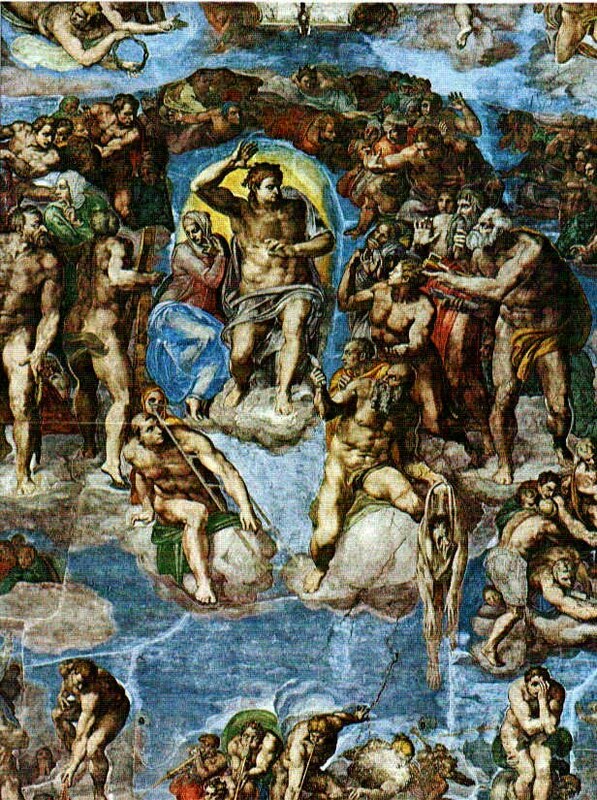 Characteristic is the appearance of Judgement Day, which was painted by Michelangelo. Christ is presented with his right hand raised in a movement of rage and the entire performance is affected by the movement of the right hand of the Judge. And as a researcher has noted, "for the first time an artist appointed by the Pope of the Roman Church gives an image of Christ that departs from the standard iconographic type and refers to a pagan deity." Perhaps here he wanted to express the absolute power of the Pope throughout the world, being the vicar of Christ on earth. Elder Sophrony, an Orthodox iconographer himself, when he visited the Sistine Chapel, wrote: "The soul is not available at all for prayer, but only for various artistic and philosophical reflections." Regarding the representation of Christ as Judge, he specifically wrote: "It's as if he is a 'champion athlete' hurling into the abyss of hell all those who dared to resist him. The gesture is 'vindictive', raw ... And I'm certain that it is not the authentic evangelical Christ." How different things are in Orthodox iconography, as shown in the icon of the Second Coming of Christ, but also in the image of the Transfiguration of Christ and the Resurrection. Inside the Sistine Chapel they could not fit in the images of the Transfiguration and the Resurrection, and this is characteristic. Let us reflect on the hagiography of another Michael, Michael Panselinos, in the Protaton of Mount Athos. These paintings have caught the attention of all scholars of art, but also of ordinary people. The Holy Community of Mount Athos has said that "the frescoes of the Great Church of Protaton is the fruit and essence of the internal monastic and liturgical life of the Holy Mountain. In this visual treasure of our holy land, theological profundity, spiritual depth and a classical aesthetic, are a fruitful harmony of the compositions, the beauty of the forms and the brilliance of the colors." According to an expert opinion on art: "The murals of Protaton reflect a conscious shift and renewed interest in the Byzantine world of the classic ideal of the harmonious, however, it is coupled with the spirituality of the Christian society it represents." Archimandrite Sophrony writes that Orthodox icon painters act on the basis of their personal experience. Some of them eliminate analogies and disfigure the human form in order to distract the praying mind from the earthly and lead it to heaven, and others with the icon want to express the union of created and uncreated. This latest case presupposes a theoptic experience. The differences between Byzantine and Western icons are clear. The Byzantine icons show Christ in glory, but with a deep peace, approaching man with philanthropic and kenotic love. They are images of love, affection, tenderness. At the same time, Orthodox icons reflect the inwardness of man, the union of uncreated and created, the transfiguration of man from the uncreated Light which entered into human existence and issues out of the body into all creation. It surrounds the man who sees this with tenderness, affection and love. At the same time the cheerful Light issues out of Christ and sanctifies the whole creation. Antithetically, there can be observed in the religious icons of the Western Renaissance the anthropocentric worldview of ancient Greek civilization, the confidence of man in himself, the rule of logic, power and pleasure, and the challenge of traditional values in that the art has an anti-metaphysical realistic character. In the West there is created a plastic icon based on humanistic experience and knowledge, which translates into a form that signals a renewal of faith in human powers and his mundane destiny. Western religious art which is naturalistic and humanistic is the humanization of dogma and has human passions in its sacred scenes. Bearing all this in mind we can expand the topic to our modern society, whether eastern or western, and see the two images of our contemporary world, which do not differ from the two kinds of images that we identified previously. The first is rationalistic and sensual, based on the absolute sovereignty of reason, the senses and the passions, which are characterized as pleasure and pain. The rule of reason leads man to dead ends, and sensationalism, with pleasure and pain, creates tragedy. Everything today rests on a surface image, enchanted by its exterior brilliance and ignoring the depth. This image is similar to the western sensationalistic image that supports the satisfaction of the senses and pleasure. The other image is the interior secret world, that aims towards the invisible side of man, and refers to the depths of the heart, where the feelings of the heart develope towards God and people, but the tragedy of the experience of pain and hell are there also. The difference between these two images are characterized symbolically between the face-person and the face-mask. The face-person has ontology and depth, while the face-mask only has surface and hides the face-person. Indeed, today people continuously use masks, either because they do not have the theological meaning of the face-person or because they want to hide their face-person. But society also is a society of masks, a window, which is liked in its outer brilliance but not in the depths of the heart, the face-person. The face-person has freedom and love, the mask has outer brilliance and beauty which obscures the face-person and wreaks tragedy. For this reason perhaps man wants to break the windows of the shops, on a quest towards freedom, but does not find its real target. Existential philosophy and existential psychology try to locate the inner tragedy of man, his pain, with the existential vacuum, the tear of pain, which is located behind the external beauty of the face-mask. Contemporary art tries to depict this depth of the world and man. Contemporary sociology is interested in locating the difference between wealth and poverty, mainly trying to retrieve the veil that covers social tragedy. Scientific studies are discovering the tragedy of man beyond the spotlight, even when the display lights are off. This work is primarily done by Spiritual Fathers, who enter the hell of human tragedy, to communicate the message of hope and resurrection. The restoration of the holy icons, which is celebrated on the Sunday of Orthodoxy, refers to the actual restoration of the image of the Father who is the Word, and the restoration of the actual image of man who are the saints. This means that the face-person of God must be restored, Who loves man freely and tenderly, and the mask of the false gods must be broken, which lead to lack of freedom and hatred. Also, this means that man also must be restored, having been created according to the image and likeness of God, and noble love and noble freedom must prevail and the mask of hypocrisy and falsehood must be lowered. In our time, in which we hear the words of the atheist existentialist Sartre: "Hell is other people", we must hear aloud the words of Saint Seraphim of Sarov: "Christ is risen, my joy". The other is not our hell, but our joy, and God is not a feudal lord who requires compliance ordered with creation, but the tender Bridegroom of our heart. And the Church is not a medieval community, but the brightly lit nuptial chamber of glory. Let us bypass the sensationalistic image to the Byzantine-Romaic image, from the mask of hypocrisy to the face-person of truth, that we may find and feel the true feast of Orthodoxy. Source: Ekklesiastiki Paremvasi, "Η Εικόνα σέ Ανατολή καί Δύση", February 2010. Translated by John Sanidopoulos.